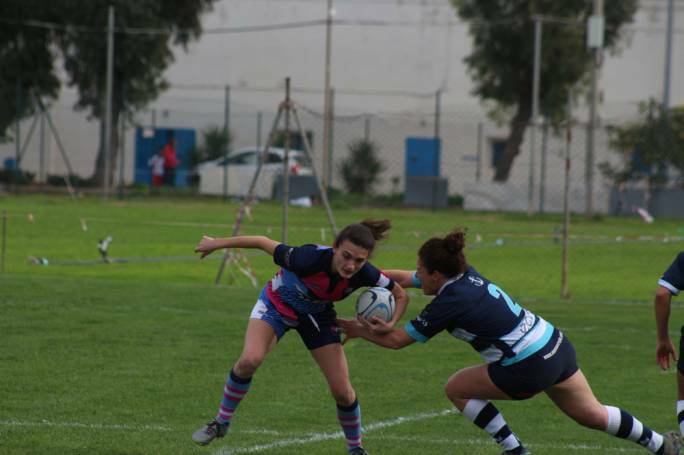 It was Women’s Rugby day down at Marsa with a head to head competition between Falcons, Overseas and Kavallieri, on a windswept morning last weekend. The first game had Overseas playing against Kavallieri with the cameras rolling to record the game for Melita Stars channel. Celine Smith was the Referee for the day, assisted by Sam Ramage. The wind was holding the passes in the air and after constant pressure, a Jacqueline Richard (10) interception gave Kavallieri the first try under the posts, the conversion was successful, they lead 7 to 0. Overseas fought back using their backline and some strong running by Clara Castillo (10) Charlotte Evans (5) and Tamsin Pace Decesare (24) to put Tessabelle Sultana (22)in for two tries, with one converted, the halftime score was 12 to 7 in favour of Overseas. 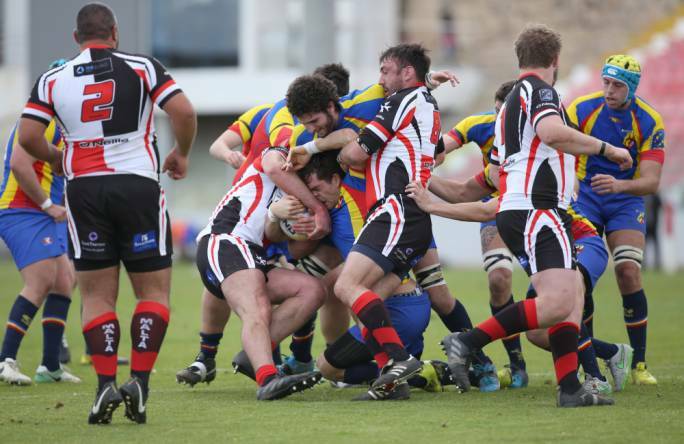 Against the wind there was a feeling Overseas would struggle in the second half, but their game got more focussed and their little flyer on the wing Wendy Pace (12) ran in two tries from 40 metres out, with no conversions the score was now Overseas 22 to Kavallieri 7. But Kavallieri had the last say with the busy Amanda Cassar (2) receiving the ball from the ever present Maria Spiteri (9) to run it in from 45 metres and make the final score 22 to 12. Falcons were on fire from the word go with their strong, experienced runners Beverie Sultana (12) and Katka Vrbacka (16) getting over the gainline and creating havoc, allowing the speed of Caroline Gafa (8) to have more freedom the run. Vrbacka (16) scored when she straightened her run, to run it in from 50 metres. Falcons 5 to 0. Caroline Gafa (8) stepped and weaved her way through to score using her speed. Beverie Sultana (12) drifted and threw an inside ball to Vrbacka (16) then back to Sultana (12) who scored under the posts. With the conversion it was Falcons 17 Kavallieri 0. Sultana (12) scores again from a backline move through the hands after a forward roll through the hands of Barbara Caruana (5) Donevellon Sladden (11) Kim Gregory (14) and Deborah Cutajar (18) all involved. Vrbacka converted the try and it was Falcons 24 to 0. Kavallieri were trying hard, but just couldn’t finish off some promising moves. Caroline Gafa (8) had the last say as she went into overdrive and scored from a long way out, to make the final Falcons 29 Kavallieri 0. Both teams were unbeaten as they faced each other, it was all go from the start as they tested each other with Tessabelle Sultana (22) using her strength to brush off a few tackles to score, with Charlotte Evans adding the conversion it was Overseas 7 Falcons yet to score. But the speed of Kimberley Riolo (6) finally came into the game as she ran around the defence to score wide out. Overseas 7 Falcons 5. Just on half time Tessabelle Sultana (22) threw a dummy pass and ran 35 metres but was dumped in a thumping tackle by Caroline Gafa (8) then from the ruck Charlotte Evans (5) forced her way through a wall of players to score, no conversion it was now. 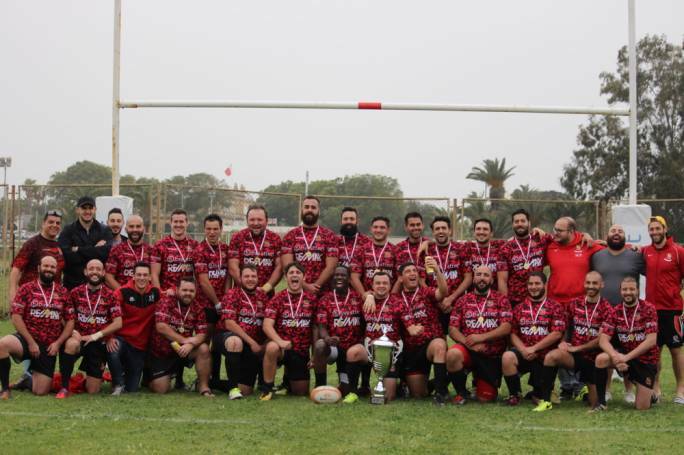 Overseas 12 Falcons 5. Noemi Perez Corral (4) Mandy Dalli (6) and Sixtien Chamouton (21) were all working hard to win the ball. But Falcons stepped up a gear and worked the ball to Caroline Gafa (8) who once again blitzed the defence with pure speed to score drawing the game at 12 all. Kimberley Riolo (6) broke Overseas’ hearts with speed down the touchline, she left the defence in tatters to score the winning try. Falcons 17 Overseas 12. Skill set and enthusiasm was a big part of Saturday’s Women’s Rugby.